It happens that I have practically some connexion with schools for different classes of youth; and I receive many letters from parents respecting the education of their children. In the mass of these letters I am always struck by the precedence which the idea of a “position in life” takes above all other thoughts in the parents’—more especially in the mothers’—minds. “The education befitting such and such a STATION IN LIFE”—this is the phrase, this the object, always. They never seek, as far as I can make out, an education good in itself; even the conception of abstract rightness in training rarely seems reached by the writers. But, an education “which shall keep a good coat on my son’s back;—which shall enable him to ring with confidence the visitors’ bell at double-belled doors; which shall result ultimately in establishment of a double-belled door to his own house;—in a word, which shall lead to advancement in life;—THIS we pray for on bent knees—and this is ALL we pray for.” It never seems to occur to the parents that there may be an education which, in itself, IS advancement in Life;—that any other than that may perhaps be advancement in Death; and that this essential education might be more easily got, or given, than they fancy, if they set about it in the right way; while it is for no price, and by no favour, to be got, if they set about it in the wrong. 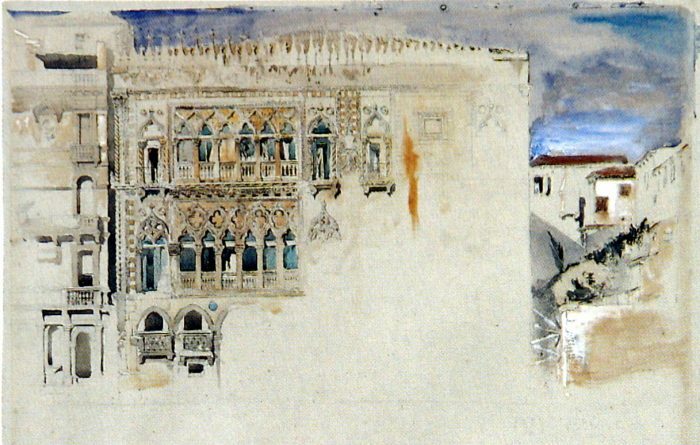 — John Ruskin, Sesame and Lilies. I know a number of people who work to recruit students to Baylor (where I now teach) and to other universities, and they have commented that it is virtually impossible to get parents interested in what kind of education, what kind of experience, their children will have in their undergraduate years. Parents only want to know whether their children will get into medical school or dental school or law school — the four years of undergraduate education are simply a very large hurdle to be leaped over to get to that STATION IN LIFE that they want for their children. Many, many parents do not care one iota about what their offspring will actually do and read and think between the ages of 18 and 22, as long as whatever it is helps (or at least does not impede) their admission to professional training. Update: I should add that I don’t blame the parents for this — they’re being asked to pay a shocking amount of money for their children’s education, and they are desperately hoping for a return on investment. I get that. But when your job is to teach those young people, the situation is regrettable — especially since so many of the students have adopted the attitudes of their parents. This Toryism, comparable to that of Swift and Johnson and Coleridge, is based on a belief in hierarchy, established order and obedience to inherited authority. He detested both liberty and equality, blaming them, more than privilege, for the injustices he condemned. Only those who held power by right, as he saw it, could be moved by a sense of duty to serve and protect the weak. This is a side of Ruskin that is likely to confuse and even repel the modern reader, in particular the radical who finds his apparent socialism attractive. But in the nineteenth century political attitudes were not so neatly shared out between left and right as they are — or seem to be — today. Modern capitalist economics were then thought progressive, being associated with the expansion of personal liberty. A radical liberal like John Stuart Mill, who championed democracy and the extension of personal rights and liberties, was also an advocate of doctrines which can be blamed for the degradations of the workhouse (Utilitarianism) and the extremes of Victorian poverty (laissez-faire). By contrast, Shaftesbury and Wilberforce, famous respectively for the Factory Acts and the abolition of slavery, were high Tories. State intervention in the economy and social welfare policies belonged to the right, for the right believed in the duty of government to govern — to secure social order and administer justice impartially. No political label quite fits Ruskin’s politics. Though he detested the Liberals, he was far from being a supporter of the Conservatives. His ‘Toryism’ was such that it could, in his own lifetime, inspire the socialism of William Morris and the founders of the Labour Party; and when he called himself a ‘conservative’, he usually meant a preserver of the environment — what we should call a ‘conservationist’. The truth is that, despite an exceptional consistency of view, throughout his life, on most matters of principle, his specific opinions changed and developed as he grew older. His attitudes to war and imperialism and the rights of women, for instance, oscillate wildly between reaction and radicalism; and he in effect concedes the ambiguity of his position when, in Fors Clavigera, he calls himself, with conscious irony, both a Communist and a Tory. It being lawful to paint then, is it lawful to paint everything? So long as the painting is confessed—yes; but if, even in the slightest degree, the sense of it be lost, and the thing painted be supposed real—no…. 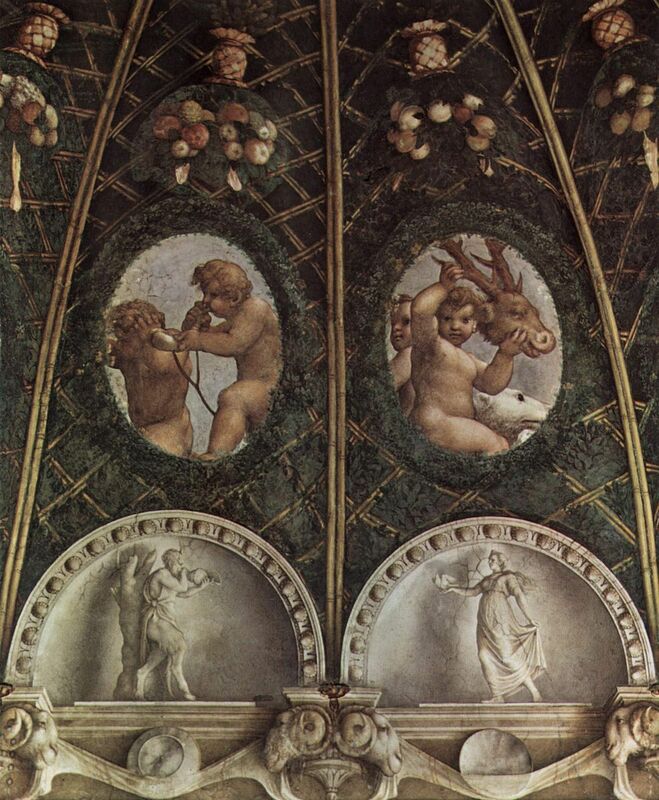 In the Camera di Correggio of San Lodovico at Parma, the trellises of vine shadow the walls, as if with an actual arbor; and the troops of children, peeping through the oval openings, luscious in color and faint in light, may well be expected every instant to break through, or hide behind the covert. 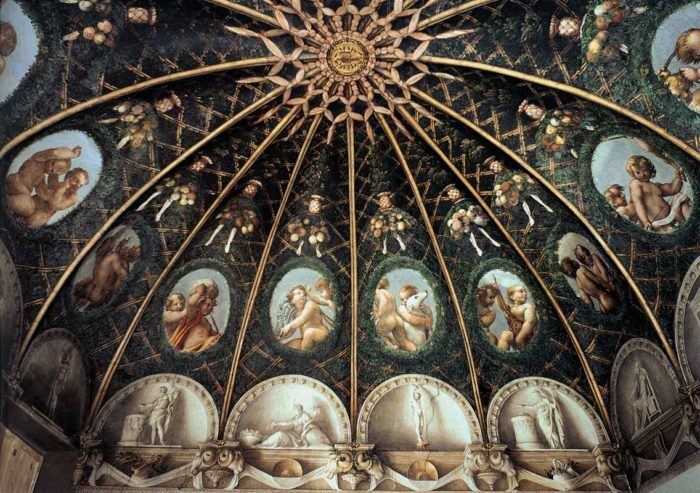 The grace of their attitudes, and the evident greatness of the whole work, mark that it is painting, and barely redeem it from the charge of falsehood; but even so saved, it is utterly unworthy to take a place among noble or legitimate architectural decoration. 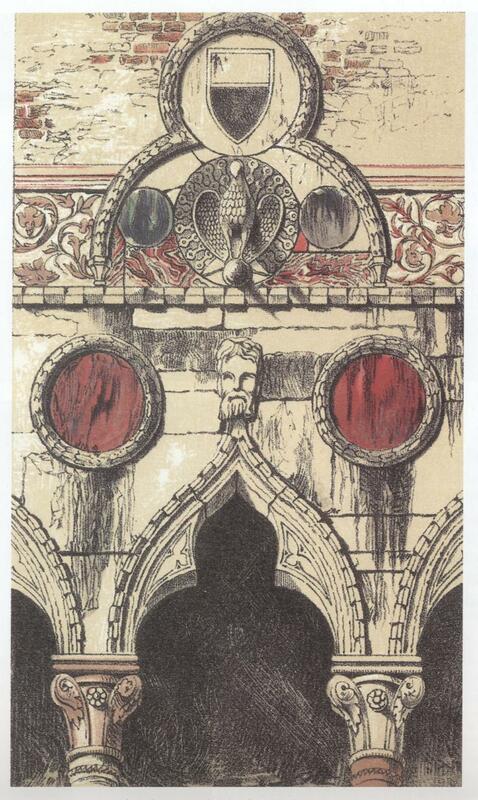 — Ruskin, The Seven Lamps of Architecture. Unique to Ruskin is the combination of an exceptionally acute aesthetic sense with an exceptionally acute moral sense, and this is one of the many moments when they struggle mightily against each other. Ruskin cannot help admiring the beauty of Correggio’s work here, but he is so deeply opposed to deception in art that he wishes he could reject it altogether. 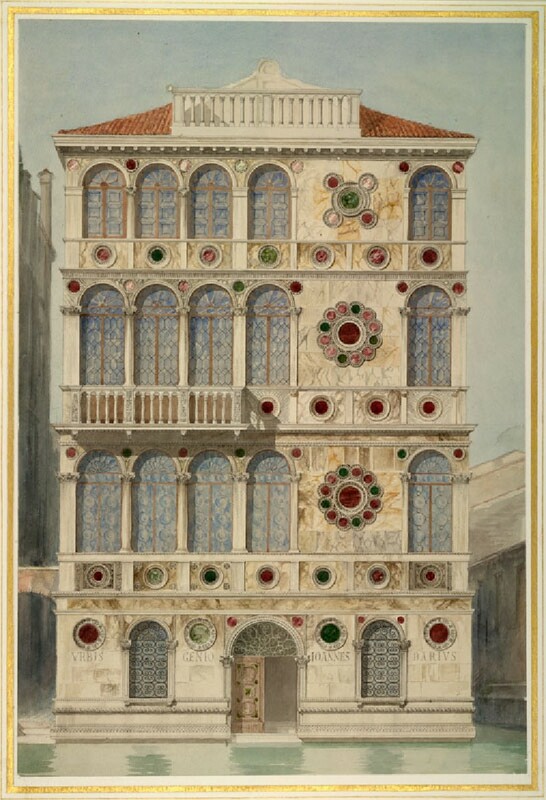 John Ruskin, 65 Casa Contarini Fasan, Venice (1841). Ashmolean. 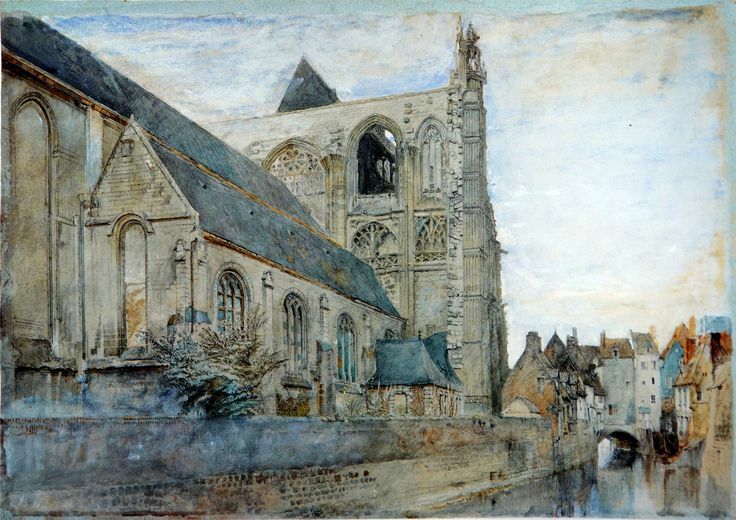 John Ruskin, Abbeville: Church of St Wulfran from the River (1868). About the moment in the forenoon when the modern fashionable traveller, intent on Paris, Nice, and Monaco, and started by the morning mail from Charing Cross, has a little recovered himself from the qualms of his crossing, and the irritation of fighting for seats at Boulogne, and begins to look at his watch to see how near he is to the buffet of Amiens, he is apt to be baulked and worried by the train’s useless stop at one inconsiderable station, lettered ABBEVILLE. 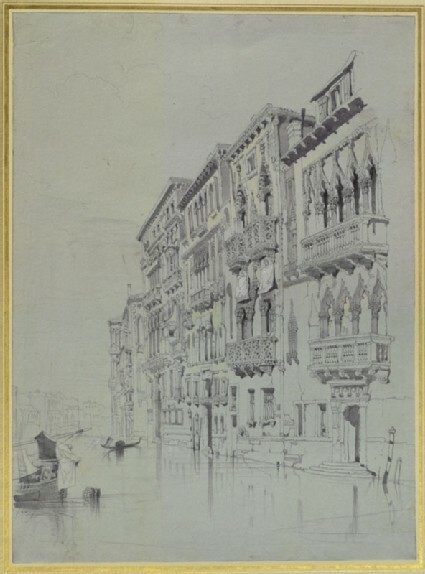 As the carriage gets in motion again, he may see, if he cares to lift his eyes for an instant from his newspaper, two square towers, with a curiously attached bit of traceried arch, dominant over the poplars and osiers of the marshy level he is traversing. Such glimpse is probably all he will ever wish to get of them; and I scarcely know how far I can make even the most sympathetic reader understand their power over my own life. 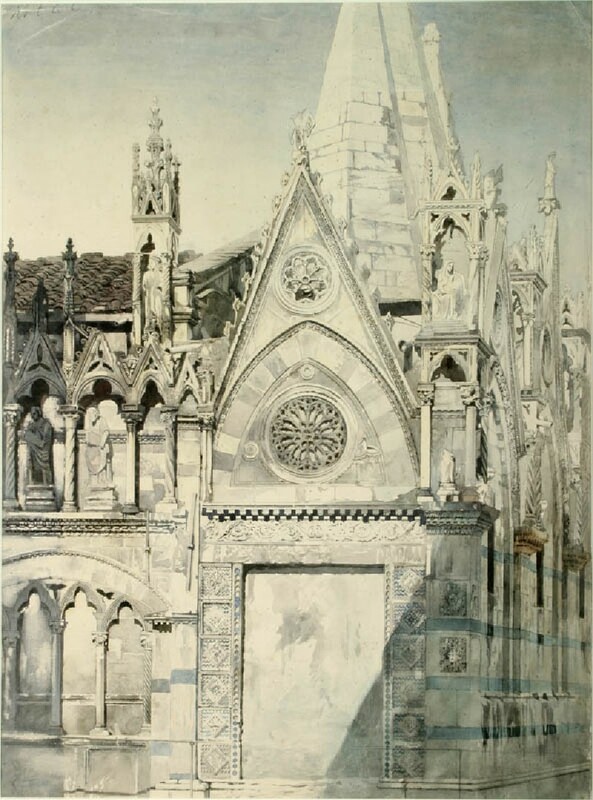 John Ruskin, La Merveille, Mont St Michel, Normandy, 1848. 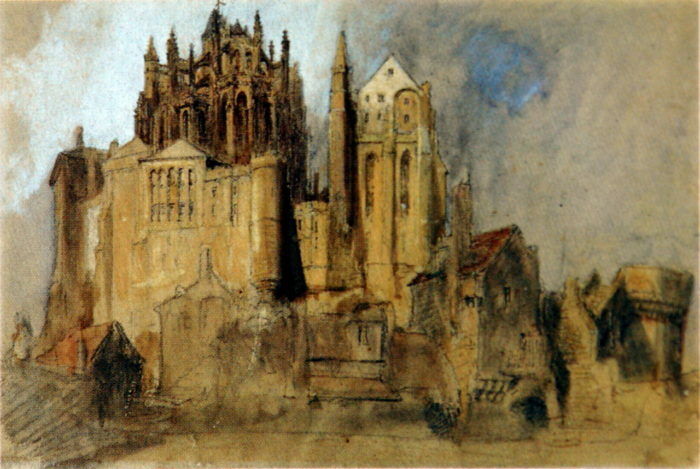 Source: Robert Hewison, Ruskin, Turner and the Pre-Raphaelites, 2000. 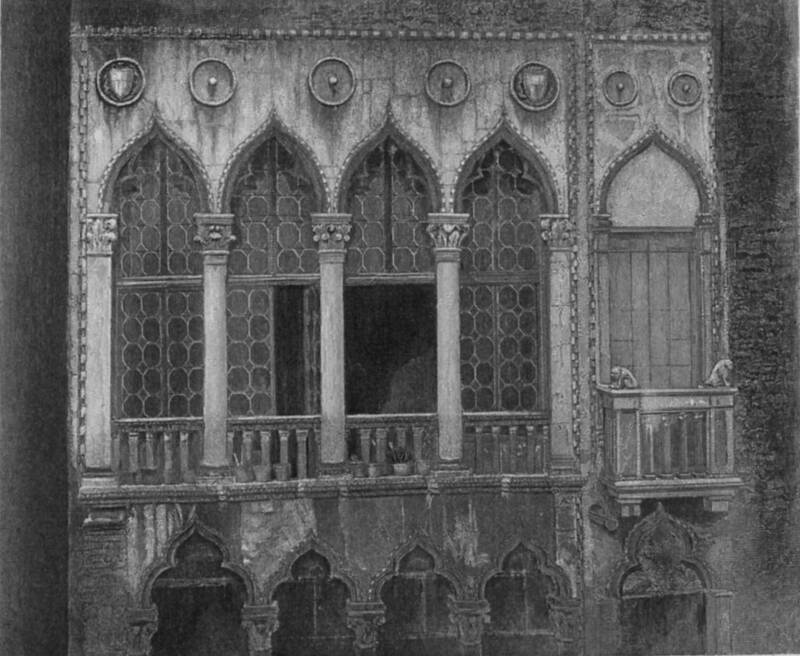 The Seven Lamps of Architecture, by John Ruskin.. 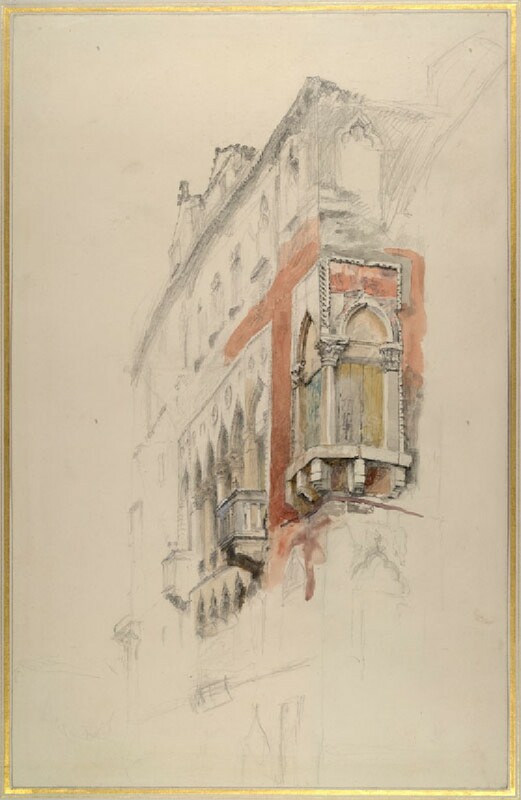 I am deep into Ruskin at the moment, so fair warning: there could be a good many quotations from him in the coming days. God has lent us the earth for our life; it is a great entail. It belongs as much to those who are to come after us, and whose names are already written in the book of creation, as to us; and we have no right, by anything that we do or neglect, to involve them in unnecessary penalties, or deprive them of benefits which it was in our power to bequeath. And this the more, because it is one of the appointed conditions of the labor of men that, in proportion to the time between the seed-sowing and the harvest, is the fulness of the fruit; and that generally, therefore, the farther off we place our aim, and the less we desire to be ourselves the witnesses of what we have labored for, the more wide and rich will be the measure of our success. Men cannot benefit those that are with them as they can benefit those who come after them; and of all the pulpits from which human voice is ever sent forth, there is none from which it reaches so far as from the grave. No thought should be called conservative that fails to see our responsibilities as Ruskin does here. There is a sanctity in a good man’s house which cannot be renewed in every tenement that rises on its ruins: and I believe that good men would generally feel this; and that having spent their lives happily and honorably, they would be grieved at the close of them to think that the place of their earthly abode, which had seen, and seemed almost to sympathise in all their honor, their gladness, or their suffering,—that this, with all the record it bare of them, and all of material things that they had loved and ruled over, and set the stamp of themselves upon—was to be swept away, as soon as there was room made for them in the grave; that no respect was to be shown to it, no affection felt for it, no good to be drawn from it by their children; that though there was a monument in the church, there was no warm monument in the heart and house to them; that all that they ever treasured was despised, and the places that had sheltered and comforted them were dragged down to the dust. I say that a good man would fear this; and that, far more, a good son, a noble descendant, would fear doing it to his father’s house. I say that if men lived like men indeed, their houses would be temples—temples which we should hardly dare to injure, and in which it would make us holy to be permitted to live; and there must be a strange dissolution of natural affection, a strange unthankfulness for all that homes have given and parents taught, a strange consciousness that we have been unfaithful to our fathers’ honor, or that our own lives are not such as would make our dwellings sacred to our children, when each man would fain build to himself, and build for the little revolution of his own life only. 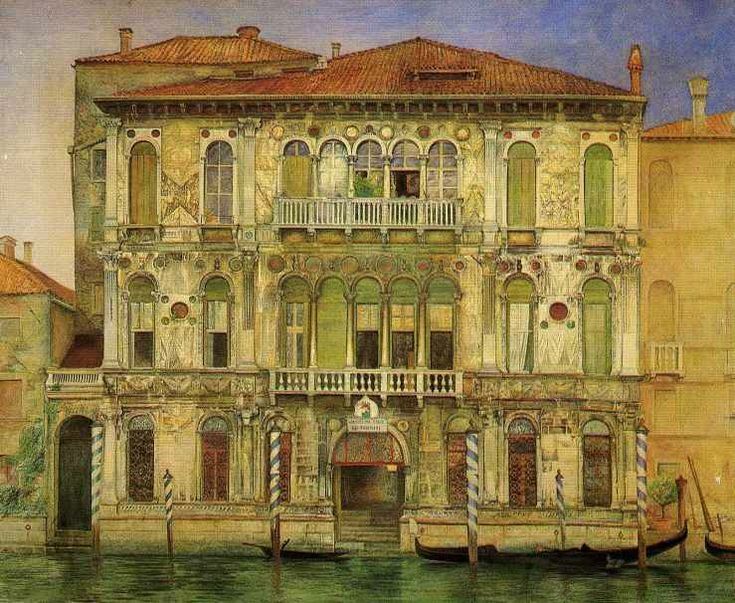 John Ruskin, The Casa d’Oro, Venice, 1845. And now, reader, look round this English room of yours, about which you have been proud so often, because the work of it was so good and strong, and the ornaments of it so finished. Examine again all those accurate mouldings, and perfect polishings, and unerring adjustments of the seasoned wood and tempered steel. Many a time you have exulted over them, and thought how great England was, because her slightest work was done so thoroughly. Alas! if read rightly, these perfectnesses are signs of a slavery in our England a thousand times more bitter and more degrading than that of the scourged African, or helot Greek. Men may be beaten, chained, tormented, yoked like cattle, slaughtered like summer flies, and yet remain in one sense, and the best sense, free. But to smother their souls within them, to blight and hew into rotting pollards the suckling branches of their human intelligence, to make the flesh and skin which, after the worm’s work on it, is to see God, into leathern thongs to yoke machinery with,—this it is to be slave-masters indeed; and there might be more freedom in England, though her feudal lords’ lightest words were worth men’s lives, and though the blood of the vexed husbandman dropped in the furrows of her fields, than there is while the animation of her multitudes is sent like fuel to feed the factory smoke, and the strength of them is given daily to be wasted into the fineness of a web, or racked into the exactness of a line. And, on the other hand, go forth again to gaze upon the old cathedral front, where you have smiled so often at the fantastic ignorance of the old sculptors: examine once more those ugly goblins, and formless monsters, and stern statues, anatomiless and rigid; but do not mock at them, for they are signs of the life and liberty of every workman who struck the stone; a freedom of thought, and rank in scale of being, such as no laws, no charters, no charities can secure; but which it must be the first aim of all Europe at this day to regain for her children. Then, miraculously, out of the hundreds of nearly indistinguishable stone figurines, my husband found the one we were looking for. 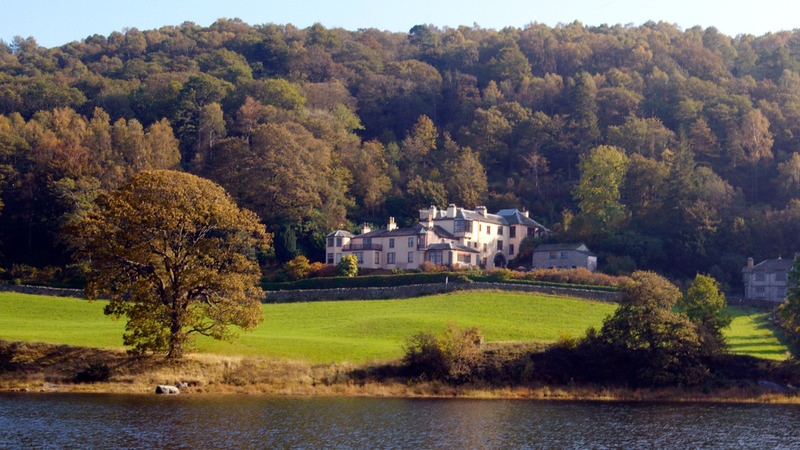 We were now standing in the very same place where Ruskin, over a century and a half earlier and Proust 50 years after him, had stood, looking with wonder and delight at the same rather coarsely carved, though touching figure. 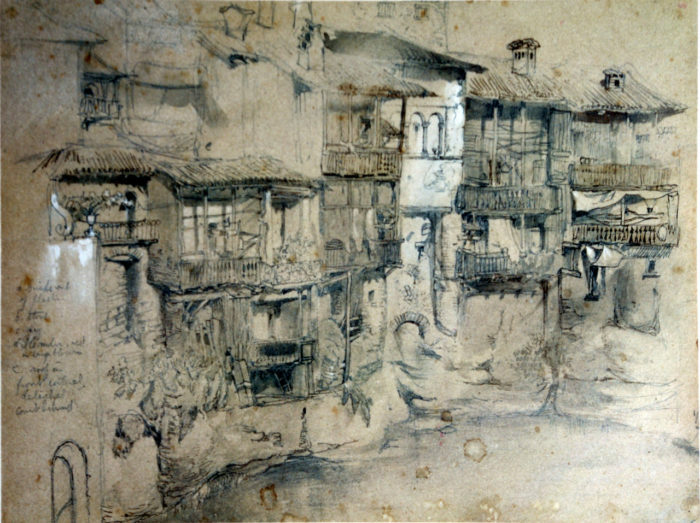 For the first time that day my experience was in accord with what I had anticipated from reading Ruskin. I felt the force of his argument about why the world looks the way it does. 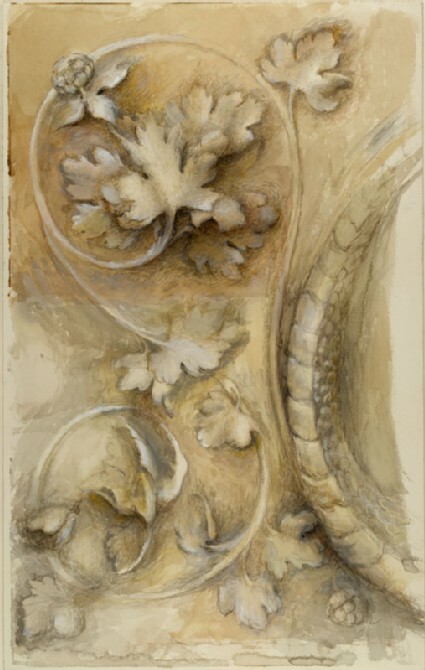 The ‘vexed and puzzled’ little fellow, in all its raw expressiveness and vitality, was the physical embodiment of the stone-carver’s joy in his labor; for why else, as Ruskin pointed out, would the carver have taken the time and care to indicate, rough line by rough line, the wrinkles under the figure’s eye as his cheek rested on his hand? After all, we are talking about a face of a figure smaller than my thumb that is a mere filling of an interstice on the outside of a cathedral gate, a figure that passionate pilgrims like my husband and myself failed to notice even when we were looking directly at the carved panel on which it reclines.